Ken Shapiro (06/07 Iron Dog Partner) and I took a trip into the Kigluaik Mountains on May 13, 2007. This is (probably!) the last trip of the winter. The weather was unseasonably cold, in the low teens, and good, firm snow. 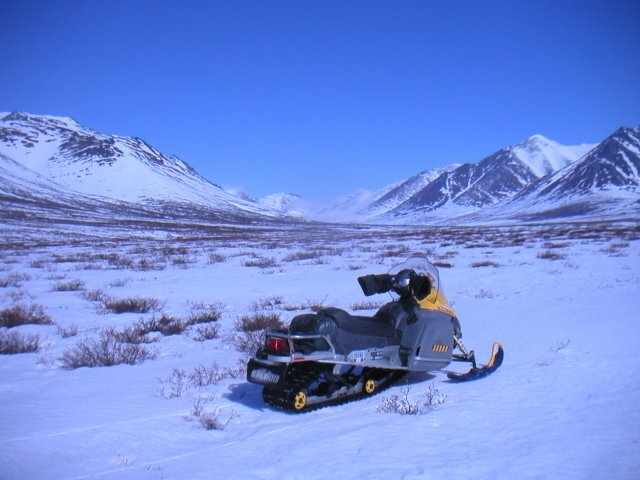 Here is my modified 2007 SkiDoo Tundra at the south entrance of the Grand Central of Alaska. This is a wide valley, with the Grand Central river flowing south out of the mountains. In this picture, Kenny is beyond me perhaps a mile; we are close to the road yet where we trailered to (32 road miles from Nome, Alaska).